The history of espresso machine began in 1901, when an engineer from Milan, Luigi Bezzera, patented the first monumental espresso machine, the basis for today’s machines, which sublimate the soluble part of the roasted grain into a strong, dark hot drink and the inner part into a short-lasting golden disc, called ‘cream’. Desiderio Pavoni purchased the patent in 1906, starting to building in his garage, now a company, one machine per day. It was the superelegant ‘column’ machine with upright boiler, all encased in copper and brass. The coffee was extracted by steam produced from water in the boiler connected to a gas cylinder. In the forties the design was completed by creating ‘piston’ or ‘lever’ to allow the total exclusion of steam using only hot water powered by a spring to a pressure of 14 bar. 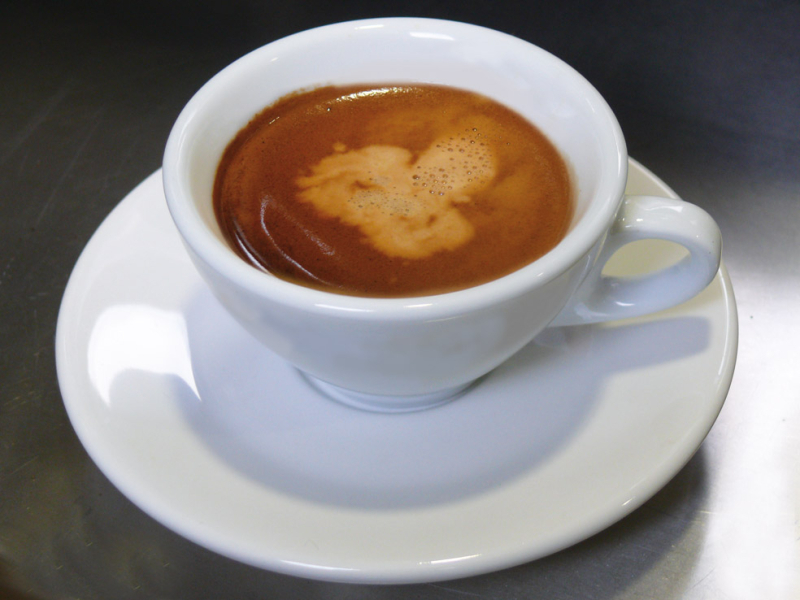 The drink it made was revolutionary: thicker and creamier and highly aromatic, the mother of the modern espresso. It’s the famous ‘Coffee Cream’, from the patented design by Achille Gaggia and Rosetta Scorza (who inherited the patent rights from her Milanese engineer). However, war once again halted development of this great invention; indeed, in Italy the state imposed high duties on imports of coffee, but also on the production of espresso machines, for which there was high market demand on the ‘enemy’ markets of Britain, France and the United States. After this, during the greatest period of social and economic recovery in our country, came a model to change the way coffee is made, introducing the design standard design still in use today. 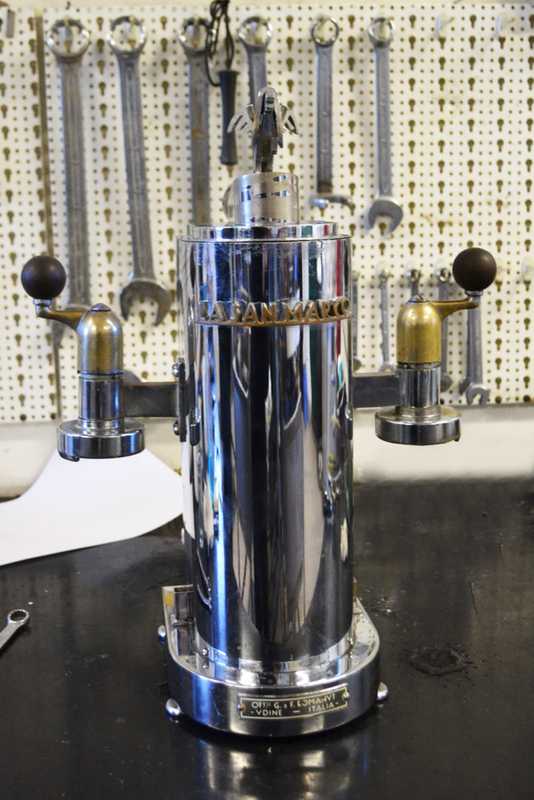 It came from the Faema factory in Milan an invention by Ernesto Valente, Gaggia engineer until 1950: the E-61 and E-61 Legend. This was the first machine with a thermosyphon circuit with heat exchangers in the boiler, which took water directly from water mains through an electric motor pump set at 9 bar pressure. A revolution… and one that is still ongoing! on the bar, as beautiful decorative icons. To make coffee, the flow of water is softened to 2°, pumped at a pressure of 9 bar into the heat exchangers, where it is heated to 88/92° and – at this pressure and temperature – reaches the infusion units in contact with a dose of 7 g of coffee and then the cup. Infusion must last 20/25 seconds and deliver the coffee into a warm cup (but not more than 65°C). • conical grinders with blades rotating at 4/500 rpm (much more expensive). They need to be checked every 600 kg of coffee. The objective of both systems is to grind coffee beans into an even powder, suitable for infusion, which is neither too fine nor too coarse, bearing in mind the humidity that affects yield (the distance between the blades can be set for finer or coarser grinding as required). The operating temperature of the grinding-dosing unit must never exceed 40/50° to avoid affecting coffee yield. This, essentially, is the difference between flat and conical blade grindingdosing units: the former rotate more rapidly and risk overheating more quickly and are thus unsuitable for heavy-duty espresso coffee service. The “espresso” system produces a very particular drink, with a layer of cream – the foam produced by the emulsion of particles of air and coffee oils – a distinct body and an extraordinarily intense aroma thanks to very efficient extraction; the creamy layer itself also prevents all the finer qualities of good quality coffee from evaporating. 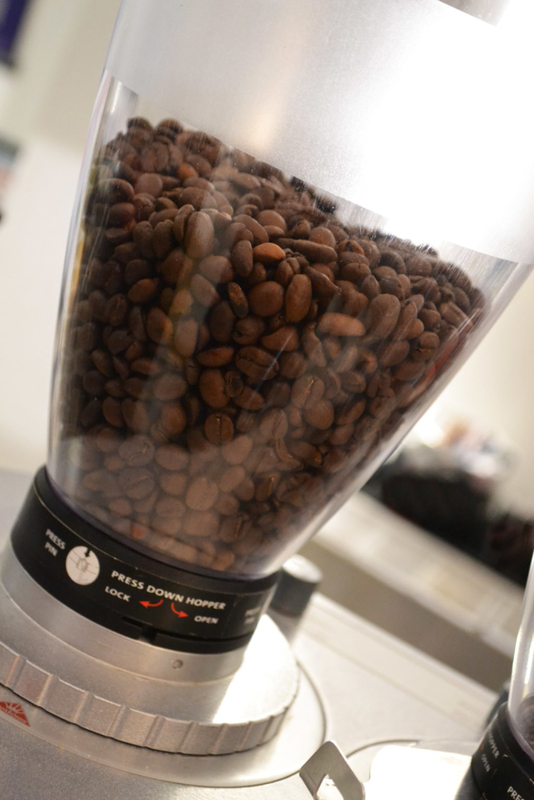 coffee-making machine, grinding-dosing unit, skill, maintenance and – naturally – a good blend. Obviously, these rules involve a great deal of work. Let’s try to list some of them, well aware in any case that coffee-making skills largely depend on direct experience of coffee machines and true passion. • Coffee packs should be opened even two hours prior to use so that the coffee itself can adapt to the surrounding environment. • The grinding-dosing unit should be thoroughly cleaned at regular intervals, since coffee releases oils that over time may become rancid and spoil even a high-quality product. • A dose of coffee should be around 7 g (6.8- 7.2) to ensure optimal infusion. • Avoid overheating the grinding-dosing unit – at over 40/50°C, it may compromise the integrity of the product. • The dose of coffee should be firmly pressed into the filter with decisive, horizontal and regular pressure so that the infusion water uses the entire dose within the time limit. • If the coffee does not pour “on time”, modify the grinding settings (not the compression!). If the coffee pours too slowly (more than 25 seconds, with the risk of remaining in contact with the very hot filter-holder too long and thus burning), then it should be more coarsely ground. On the contrary, if the coffee pours too quickly (less than 20 seconds with fast and incomplete infusion) it should be ground more finely. Generally speaking, the grinding unit can be set 1 or 2 notches up or down as required. • The usual cause of such changes is the degree of humidity in the air absorbed by the coffee powder. It is therefore advisable to grind coffee only as required and avoid leaving it in contact with the air for too long. It is a good rule to finish previously ground coffee in the evening so that in the morning and during the day it is always freshly ground. Coffee, especially when already ground, is a “live” product that breathes! • Always check blade wear and replace the blades after 400 kg for flat blades and 1000 kg for conical blades. The coffee must be finely ground and not crushed by blunt blades. • Always use fresh, decalcified water – hard water makes heavy, creamless coffee. • The temperature of the water must be about 120°C in the boiler and about 88° at the pouring spout; the pump should ensure a pressure of 9 bar; minor variants depend on the type of machine used. • It is of fundamental importance to keep espresso machines clean. The gaskets, pouring spouts (that must ensure free flow of water) and filters should be cleaned thoroughly every day with a special blind filter. Filters and filter-holders must also be cleaned, since – like the spouts. They tend to accumulate burnt coffee (and thus spoil good “espresso”). Deposits of milk on the steam jets should be frequently removed to prevent them going rancid. The drip tray underneath the machine should be cleaned to avoid blockages caused by deposits of coffee grounds. All these rules of cleanliness must be scrupulously and regularly observed, accompanied by frequent checks of the entire system by specialist personnel. • Always use warm cups; cold cups “block” espresso coffee and spoil its body, while if they are too hot (over 65°) they overheat and tend to “burn” it. • Constantly verify infusion and delivery times. This short time-scale (20/25 seconds) involves a very delicate process: the boiling water initially wets, swells and mixes with the coffee powder, absorbing all its aromatic properties; it then passes through the dose of coffee and is poured into the cup. If the coffee is properly regulated and flows in a thin and continual line (the so-called “mouse tail”) with the colour of a “friar’s habit” into the cup with concentrated perfumes and aromas enclosed in a thick, hazel-coloured cream… we can proudly say we have achieved our objective. “Espresso” coffee is an Italian tradition, style and taste. For decades, it has been one of the most highly appreciated and characteristic Italian products abroad. This is truer today than ever before. 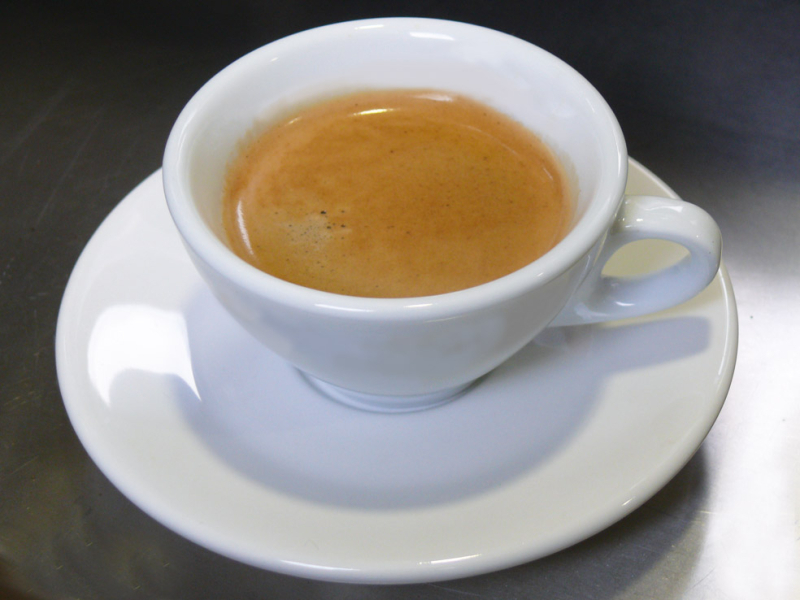 In Italy, espresso coffee is a daily custom, an important moment of pleasure, a ritual – perhaps excessively so. Every tradition is a link between past and future and espresso coffee must always keep pace with the times to ensure its future. It must be kept up-to-date and made important even for generations with different lifestyles and stimuli from those who created and developed the espresso coffee tradition. ‘Hazelnut-reddish’ cream, sometimes with a kind of ‘tiger stripe’ effect. Good consistency with 3-4 mm thick, uniform mesh. Round body, perfect, perfectly balanced taste and aroma, very persistent taste. Dark cream with a lighter spot. Low consistency and thickness, with hole in the middle. Hard taste, bitter and astringent, low aroma, lingering taste. Low cream consistency, with large bubbles. does not linger and little aroma. There are different ways of drinking coffee and this variety indicates the versatility of this product and how it has been enjoyed in different periods. a dose of ground coffee is added to boiling water in a jug. Infusion takes about 3-5 minutes and the coffee is then filtered through a strainer. 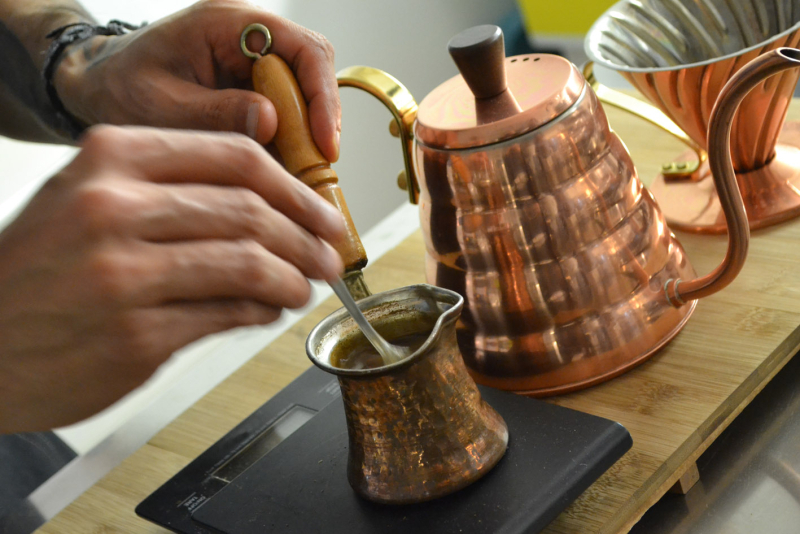 • Turkish-style: a special pot called “ibrik” is used to boil the water and then add very fine-ground coffee and sugar. This is then left to boil again. This method produces very particular coffee: strong, dense and (despite the sugar) rather bitter. • Neapolitan: the special coffee pot has a removable filter that is filled with finely ground and highly roasted coffee; the base is filled with water and left to boil, with the top part (with a pouring beak) tightly closed. Once the water boils, the pot is turned upside down so that it can flow into the other section, filtering through the coffee. • Moka: a very popular system comprising a stove top coffee pot in three sections: a boiler to boil the water, a filter with a dose of about 6 g of fairly well ground coffee and a third section to collect the drink. The special feature is that the water has no escape route other than the steam pressure that rises into the second recipient filtering through the coffee in about one minute. The drink has a distinct flavour and an intense aroma. • Filter. Perhaps the most common system in the world. Rough ground coffee is used – from 5/6 g of light roasted in North America up to 10 g of medium roasted coffee in France. Boiling water is simply poured over the coffee placed in special paper or fabric filters and then percolates by gravity into a pot underneath – the resulting coffee is delicate and not too strong for frequent consumption. This system only exploits about 20% of the coffee components in 150/200 ml cups. • Soluble. Not widely used in Italy but popular abroad. Preparation is extremely easy: simply dissolve the product in hot water using about 2/3 g of coffee for 150/200ml cups. Processing of this kind of coffee involves differences such as freeze-dried (better and more expensive) or spray-dried. 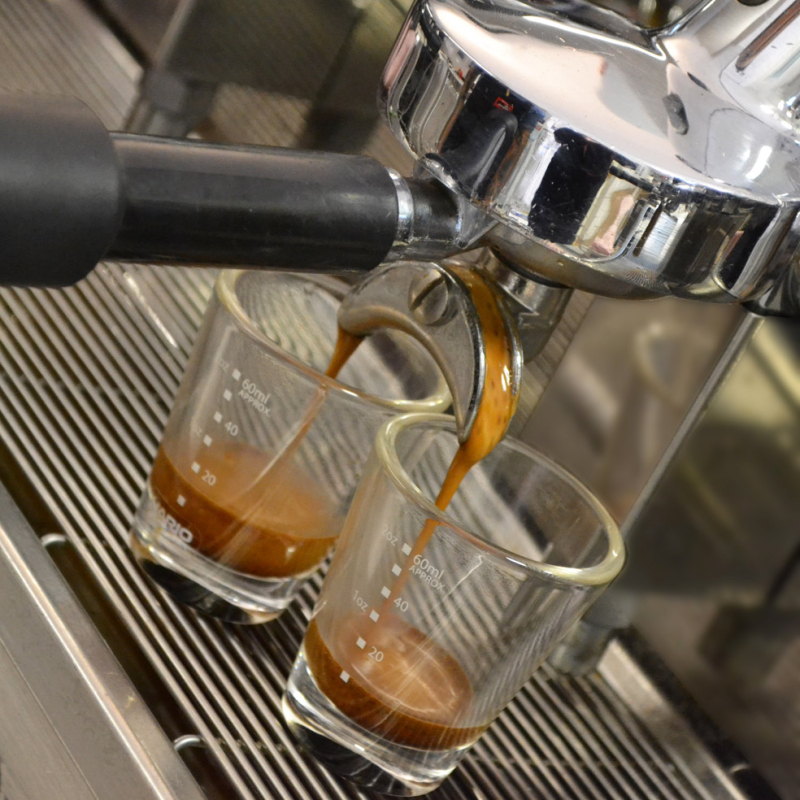 • an Italian tradition becoming increasingly popular abroad: “espresso” coffee: specific equipment prepares a very concentrated, fully-flavoured drink with an intense body and aroma. This equipment involves an espresso-coffee machine, a pump, a water softener and a grinding-dosing unit. 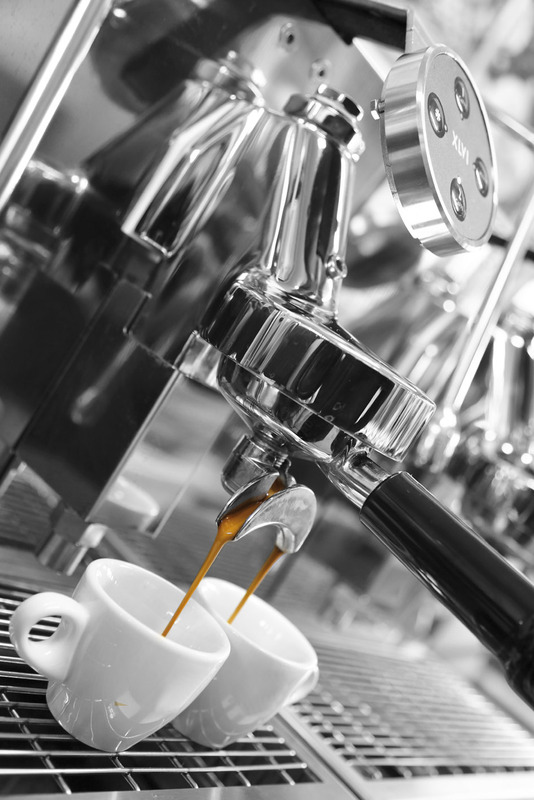 The vital technical elements for making good espresso coffee have remained unchanged for decades, despite the refinements and ease of use offered by certain electronic components. These elements include high-quality materials (copper, brass, steel) in a series of fundamental components such as the boiler, the heat exchanger, solenoids, infusion units and filter-holders, the pressure switch used to set boiler pressure and the pressure gauge indicating pump and boiler pressure.